From last few years phones are getting smart, Laptops are becoming Tablets and CD Players are becoming iPods. All these changes make us more dependent on electronic devices than ever. Though these devices keep us connected, but when battery runs out they become liability. That makes battery charging one of the most important needs of today’s world. In my post mobile charger using bicycle, I discussed how we can charge our battery while riding on a bike. Today we will discuss about Solar powered Bag which is not only useful and handy but uses green technology too. Solar bag consists of skinny film solar cells and batteries. It contains a flexible mono crystalline solar panel, battery, charge controller, plugs, cords and light bulbs. It provides users with power up to 120 watt-hours/day, capable of powering electronic equipment’s rated up to 300 W.
Monocrystalline silicon is the base material of the electronic industry. It consists of silicon in which the crystal lattice of the entire solid is continuous, unbroken (with no grain boundaries) to its edges. It can be prepared intrinsic, i.e. made of exceedingly pure silicon alone, or doped, containing very small quantities of other elements added to change in a controlled manner its semiconducting properties. The solar panels convert sunlight into electricity, which is stored in the batteries and can be used to power portable electronic appliances like mobile phones and mp3 players. 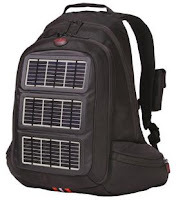 Solar backpacks are light-weight, hence making it easier to carry. Flexible solar panels also are light and portable, as well as waterproof. Backpack allows patients to carry medical devices with them.